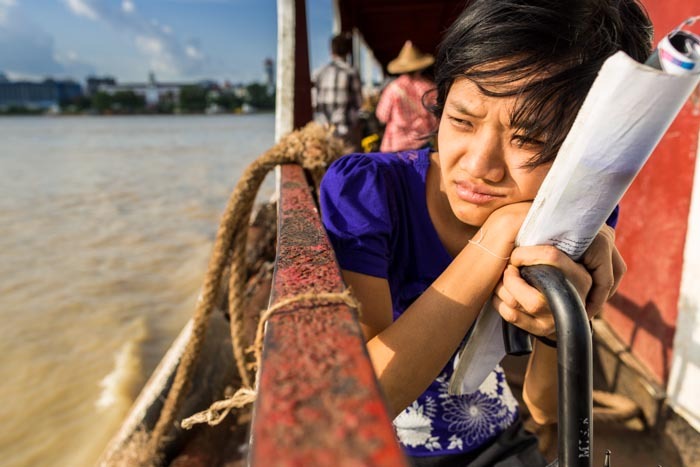 A woman on the Yangon - Dalla ferry. Myanmar, especially lower Myanmar, is a country defined by water. 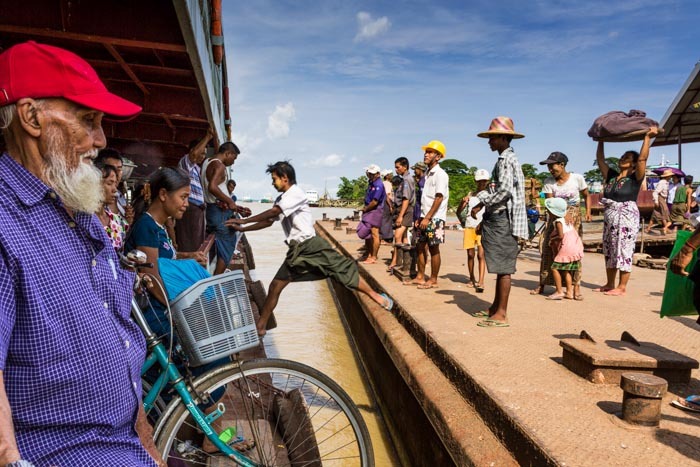 The Irrawaddy River is the nation's lifeline. Water from the Irrawaddy irrigates the fields, boats move people and freight the length of the river. It's celebrated in Burmese history and mythology. Yangon, Myanmar's commercial capital, is on the Yangon River, a tributary of the Irrawaddy. Boats, everything from small rowboats to huge ocean going freighters, move up and down and across the river. Yangon's riverfront is one of the most intriguing places in a very intriguing city. Dala is a working class community across the river from Yangon. The fastest, cheapest and easiest way to Dala is on one of the ferries that run continuously across the river. In the morning crowded ferries bring workers into Yangon and in the evening they return them home. All through the day shoppers, students and visitors use the ferries to get across the river. For the Burmese, the fares are dirt cheap - roughly the equivalent of .04¢ US. A teenager jumps to an arriving ferry while Dala bound passengers wait to disembark. The ride across the river takes about 15 minutes. I spent the better part of an afternoon riding the ferry, back and forth across the river time after time. No two trips were the same. There are more photos from the Yangon-Dala Ferry in my archive.